BYU linebacker Kyle Van Noy (BA ’13) was at home with his family in Utah when his cell phone began vibrating on the afternoon of May 9. Detroit Lions head coach Jim Caldwell and general manager Martin Mayhew were on the line. “You’re my guy,” Caldwell told Van Noy. Later that afternoon the Lions used their second-round pick to select the 23-year-old two-time all-American from Reno, Nev. Wearing a shiny blue Lions polo shirt, Van Noy faced the media the following day at the team’s headquarters in Allen Park, Mich.
Those were not idle words. Playing in the NFL has been Van Noy’s lifelong dream. But there is one thing Van Noy has always wanted more—to be believed in, to be wanted. Those themes run deep with him. When Kyle was born in Las Vegas in 1991, his biological mother placed him for adoption with LDS Family Services. She wasn’t LDS, but she wanted her baby raised in an LDS home. She got her wish. Layne and Kelly Van Noy were living in California when they adopted Kyle. They immediately recognized that he had an indomitable spirit. As a baby Kyle wore corrective leg braces. At night his parents fastened a bar between his shoes, forcing his legs to remain apart during sleep. Before Kyle turned 2 he began climbing out of his crib each morning and crawling on his elbows GI Joe–style down the hall to his parents’ bedroom, the bar still fastened to his shoes. That’s how badly he wanted to be near his mother and father. The braces eventually came off and the family relocated to Reno, where his parents began encouraging Kyle’s athletic ambitions. Kyle excelled in a flag football league for 8-year-olds. He was only 5. By his junior year at Reno’s McQueen High, more than 20 top football programs had approached Kyle, including LSU, Nebraska, Oregon, and UCLA. 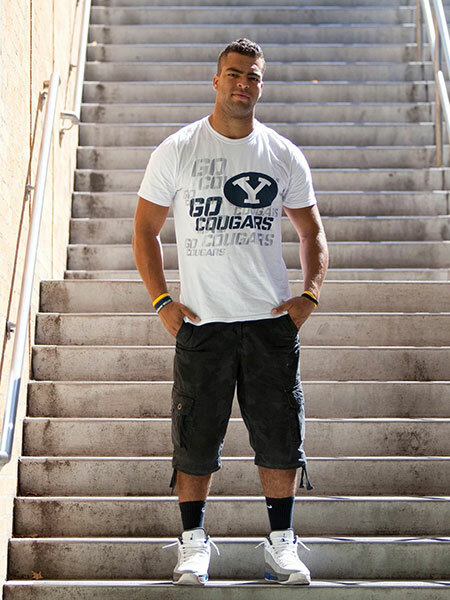 BYU was among the schools recruiting Van Noy, but he had no interest in playing for his faith’s flagship school. Mendenhall was drawn to Van Noy because he was the only kid not wearing a white shirt and tie. When the coach made eye contact, Van Noy returned his gaze with a skeptical, hard stare. Mendenhall called an audible, redirecting his remarks to an audience of one. He spoke about geese flying in V formation, taking turns at the point and never abandoning a member of the flock. Van Noy was riveted. In all his years of coaching, Mendenhall couldn’t recall such candor in a student-athlete. The point was reinforced when Van Noy got in trouble with the law in Reno just weeks after accepting a scholarship to play for BYU. Due to Van Noy’s juvenile status at the time of his arrest, the incident went unreported. No one at BYU was aware of it until Van Noy flew to Utah specifically to tell his coach. Surprised to see Van Noy in his office doorway, Mendenhall knew there was trouble when he saw tears in Van Noy’s eyes. “Let me help you,” Mendenhall told him. Biting his lip and looking away, Van Noy was convinced his mistake would cost him his scholarship. Still, he told his coach about his run-in with the law following a late-night party back home. To his surprise, Mendenhall rose, put his arms around him, and told him he loved him. Van Noy made good on that acceptance. Working with Mendenhall and the university, he agreed to a one-year probation and joined the Cougars for his first summer camp in 2010. He earned a starting position by midway through his freshman year. He became a model student. And by his junior year he had emerged as one of the top linebackers in the nation. He capped off his junior season with a record-setting performance in the 2012 Poinsettia Bowl, where he was named the game’s MVP after scoring two touchdowns in less than seven minutes. Van Noy graduated with a degree in history in December 2013. He also got engaged to Marissa Powell, the former Miss Utah who has been his best friend throughout his time at BYU (the two married in June). He leaves BYU as one of the best defensive players in the school’s history. By joining the Lions, Van Noy reunites with another one of his best friends—former BYU teammate Ezekiel “Ziggy” Ansah (BS ’13), who was the Lions’ first-round draft choice one year earlier. Jeff Benedict is a special features writer for Sports Illustrated and the author of 12 books. His latest book—The System: The Glory and Scandal of Big-Time College Football—includes sections on the college careers of Kyle Van Noy and Ezekiel “Ziggy” Ansah.